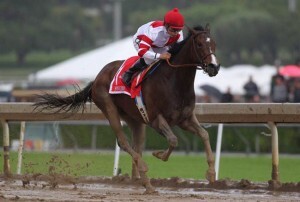 Undefeated Songbird Simply Brilliant In Santa Anita Oaks: Sent to the front from the rail in her first-ever start on a sloppy track, undefeated Songbird responded with a brilliant gate to wire performance in winning Saturday’s Grade I, $400,000 Santa Anita Oaks by 3 ¾ lengths under Mike Smith. 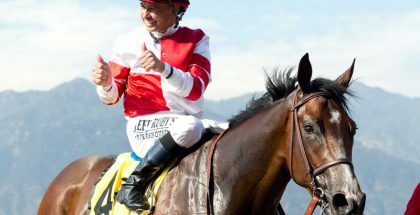 Last year’s Eclipse Champion 2-year-old filly, Songbird covered 1 1/16 miles in 1:44.14 and is now unbeaten in seven starts for Fox Hill Farms, Inc. and Jerry Hollendorfer. 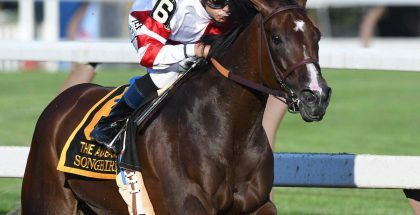 A Kentucky-bred daughter of Medaglia d’Oro, she’ll now be pointed to the Grade I Kentucky Oaks on May 6. 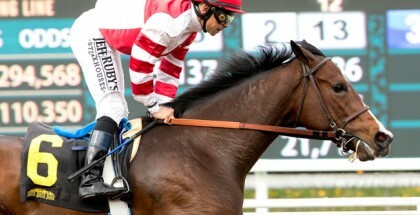 Pressed into the first turn by Forever Darling, who was ridden by Martin Pedroza, Songbird settled into her customary high cruising speed and was completely in charge through fractions of 23.34, 47.17, 1:11.21 and 1:37.13. “She’s just incredible,” said Smith, who’s been aboard for all seven wins. “I feel so blessed and I keep pinching myself, having to remind myself that I’m the one that gets to keep the weight on her. That’s really all I do. 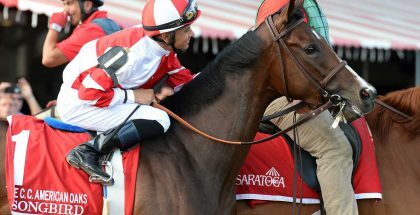 With a staggering $751,734 bet to show on her, Songbird was dispatched as the overwhelming 1-9 favorite in a field of seven sophomore fillies and paid $2.20, $2.10 and $2.10. Ridden by Flavien Prat, Mokat ran on for the place, finishing a neck in front of She’s a Warrior. Off at 14-1, Mokat paid $4.60 and $3.00. She’s a Warrior, who was handled by Gary Stevens, finished 1 ¾ lengths in front of Forever Darling. Off at 22-1, She’s a Warrior paid $4.20 to show.